Many of the hieroglyphs etched into the walls, ceilings, and pillars of Assassin’s Creed Origins aren’t just random symbols, you know. If you’re an experienced hieroglyphist, you can actually read and translate some of them into relatively logical meanings. Now, I’m going to go out on a limb here and say that probably less than 1% of Assassin’s Creed fans are professional experts in this particular field of ancient translation, so Ubisoft really didn’t need to go to all that trouble. But it did. And even though we barely notice the results, it still makes all the difference. Assassin's Creed has always felt like a franchise that's never been able to quite reach the pinnacle of its potential. Over the last ten years, every new instalment has attempted to fulfil the series' towering promise as an immersive historical adventure, but mechanical stumbles meant each one eventually dived back into the safe comfort of the Ubisoft open-world hay bale, just before making it to the top. This year, though, things are different. As the biggest and deepest Assassin's Creed game yet, the sheer scale of Origins is on par with any other modern day RPG, but that size is not the driving force behind its success. 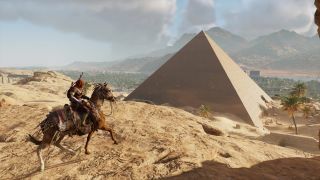 Instead, it's the array of small but essential improvements that Ubisoft has taken the time to think about, during the series’ two-year hiatus, which makes Assassin's Creed Origins the best game in the franchise. Many of these improvements have their roots in ideas and concepts originally introduced by other big games from recent years. Whether it’s subtly replicating Destiny 2’s user interface or taking inspiration from Shadow of War’s persistent enemy characters, these concepts have been carefully adapted to suit Ubisoft’s own vision. Make no mistake, then, Origins is a dense amalgamation of very specific open-world, action RPG tropes, but each strand of its game design DNA is there to streamline and refresh the experience for a franchise which has always found it hard to explore new territory. That’s not to say that Origins is free of the franchise’s historic relationship with gameplay jank. Stealth is still fiddly, the transformed combat system lacks an expected level of finesse, and Ancient Egypt certainly has its fair share of bugs and glitches. But, unlike previous Assassin’s games, Origins is an open-world in which you want to go off the beaten path, rather than feel obliged to out of an obsession with Ubisoft’s busywork-laden map. That’s thanks to the nuts and bolts holding the game’s refined infrastructure together. Take Eagle Vision. In former titles, this mechanic worked similarly to how a lot of ‘vision’ abilities do in stealth games, where pressing a button would grant you the ability to see through walls and highlight points of interest. It’s a fairly bland way of expressing a superpower, and its long been argued that such a gimmick can make a game too easy and rudimentary in its design, but Ubisoft stuck with it for nine Assassin’s Creed adventures nonetheless. With Assassin’s Creed Origins, Ubisoft Montreal decided to take a page out of Far Cry Primal’s book, and allow Eagle Vision to finally live up to its name by letting players control Bayek’s very own bird of prey, Senu, from the sky. From a technical point of view, it still works in the same way as previous iterations of Eagle Vision, as you tag landmarks and spot enemies for a tactical advantage, but the player’s newfound freedom to travel anywhere they choose as Senu, regardless of where Bayek is, breathes new life into a tired tradition. You can easily while away hours in the air, just admiring the many breathtaking vistas and biomes of Egypt from above, free from any danger, as the game’s warm soundtrack comes to the fore. It’s a mesmerizing experience, almost therapeutic in its sensory impact, and just one of the many details which elevates Assassin’s Creed Origins above its predecessors. It’s moments like these, brought about by design elements that are generally considered ancillary to the meat of the game, which enrich Assassin’s Creed Origins. They’re the kind of small embellishments that are appreciated most when discovered naturally, through the player’s own personal experience. These new bells and whistles are numerous, too, found across almost every aspect of Origins’ design. The game’s photo mode, a series first, may initially appear as nothing more than an optional gimmick, but it quickly becomes an essential lens through which you can closely admire the detail behind the game’s tender visuals. The abundance of side quests for once feel meaningful enough to furnish the historical context with micro-narratives emblematic of Egypt’s wider social, political, and cultural troubles. Even the simple act of travelling is advantaged by the fact that each region of the world has its own finer set of cultural idiosyncrasies, which makes you feel as though you’re exploring an entire country, and not just an enclosed microcosm of its best bits. "An open-world in which you want to go off the beaten path, rather than feel obliged to." Assassin’s Creed games are at their worst when they feel excessively automated or systematic, in which the game’s overbearing infrastructure quickly undercuts any notions of emergent interactivity. Origins rarely falls into this trap, as each delicate flourish acts as a puzzle piece which, when put together, paints a breathtaking picture of Ancient Egypt. It’s not a perfect game, by any means, but Assassin’s Creed Origins should be celebrated all the same, as a title which finally feels like the first fully emancipated realization of Ubisoft’s original vision for its most prolific franchise.